High field MRI’s use powerful magnetic fields to quickly generate extremely high-resolution images. Because high field MRI’s also scan very quickly, they are excellent for visualizing physiological processes in addition to structural tissue. Early MRI’s were based on 0.35 and 0.5 Tesla magnets, which were quickly replaced by 1.5 Tesla magnets by the late 1980’s. Higher power magnets yield relatively lower signal-to-noise ratio, which in turn can translate into higher resolution imaging and/or reduced imaging time. 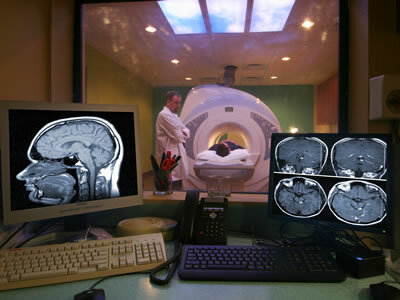 By the 1990’s, advances in producing homogeneous magnetic fields and robust signal reception radiofrequency arrays, as well as mechanisms and procedures to ensure patient safety, led to the introduction of high field MRI’s based on 3.0 Tesla magnets, which offered significant improvements in image resolution. Ultra-high field MRI’s are now being introduced which use magnets of up to 7.0 Tesla. Significantly, high field MRI facilitate new functional MRI techniques which use blood-oxygen level contrast, angiography and other techniques to map muscle oxygenation and muscle function. Ultra-high field MRI also has relatively greater sensitivity to low-gamma nuclei, enabling assessment of sodium physiology and phosphorus metabolites. Ultra-high field MRI enables studies of human joints such as knees and wrists, since it produces high resolution images of cartilage, which cannot be imaged by conventional MRI due to its small size. Evaluation of joints is further enhanced by ultra-high field MRI’s ability to evaluate cartilage biochemistry via sodium MRI and gadolinium-enhanced MRI. Bone micro-architecture studies also generate metrics for structural alterations associated with bone disorders such as osteoporosis. Sodium MRI supports physiological assessment of muscle as well by providing information about the sodium-potassium pump and ion balance. High field and ultra-high field MRI offer great promise in the field of brain imaging. A 3.0 Tesla MRI’s provide spatial resolution as low as 200 µm, enabling imaging of blood flow within the vessels of the brain. At 7.0 Tesla, resolution of 50 µm may allow detection of senile plaques such as those associated with early stages of Alzheimer’s disease. At very high magnetic fields, MRI’s could be used to detect biochemical reactions as well as very small lesions, facilitating diagnosis and early treatment of early stage cancers, myocardial infarctions, diabetes and other metabolic disorders.